Windows Vista: Release Date, Editions, Licenses, Etc. Microsoft Windows Vista was one of the least well-received Windows operating systems released by Microsoft. While for the most part corrected in later patches and updates for the operating system, several initial system stability issues plagued Windows Vista and was a major contributing factor to its poor public image. Windows Vista was released to manufacturing on November 8, 2006, and made available to the public for purchase on January 30, 2007. Windows Vista is preceded by Windows XP, and succeeded by Windows 7. The most recent version of Windows is Windows 10, released on July 29, 2015. Windows Vista is no longer officially sold by Microsoft but you might be able to find a copy on Amazon.com or eBay. Windows Vista Starter is available to hardware makers for preinstallation on small, lower-end computers. Windows Vista Home Basic is only available in certain developing markets. Windows Vista Enterprise is the edition designed for large corporate customers. Two additional editions, Windows Vista Home Basic N and Windows Vista Business N, are available in the European Union. These editions differ only by their lack of a bundled version of Windows Media Player, a result of anti-trust sanctions against Microsoft in the EU. All editions of Windows Vista are available in either 32-bit or 64-bit versions except for Windows Vista Starter, which is only available in a 32-bit format. The following hardware is required, at a minimum, to run Windows Vista. The hardware in parentheses is the minimum necessary for some of the more advanced graphics features of Windows Vista. Your optical drive will need to support DVD media if you plan on installing Windows Vista from a DVD. Windows Vista Starter supports up to 1 GB of RAM while 32-bit versions of all other editions of Windows Vista max out at 4 GB. Depending on the edition, 64-bit versions of Windows Vista support much more RAM. Windows Vista Ultimate, Enterprise, and Business support up to 192 GB of memory. Windows Vista Home Premium supports 16 GB and Home Basic supports 8 GB. Physical CPU limitations for Windows Vista Enterprise, Ultimate, and Business is 2, while Windows Vista Home Premium, Home Basic, and Starter support just 1. Logical CPU limitations in Windows Vista are easy to remember: 32-bit versions support up to 32, while 64-bit versions support up to 64. The most recent service pack for Windows Vista is Service Pack 2 (SP2), which was released on May 26, 2009. Windows Vista SP1 was released on March 18, 2008. 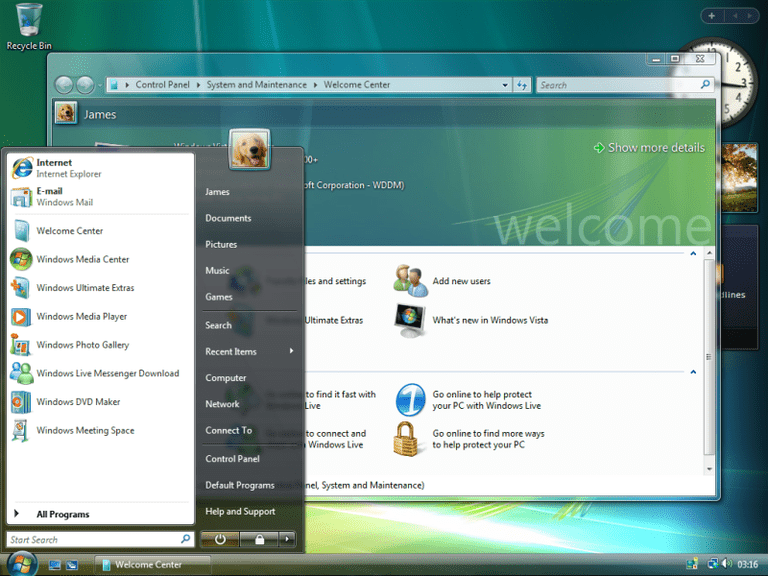 The initial release of Windows Vista has the version number 6.0.6000.